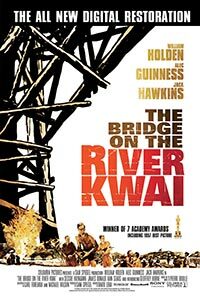 The Bridge on the River Kwai (1957): Dir. David Lean. Written by: Carl Foreman and Michael Wilson. Based upon the novel Le pont de la rivière Kwaï by Pierre Boulle. Starring: Alec Guinness, William Holden, Sessue Hayakawa, Jack Hawkins, and James Donald. Unrated. Running time: 161 minutes. Director David Lean balances ethical quandaries, British humor, and high-stakes suspense in this 1957 classic, a selection that easily stands as the best war films I’ve seen in my countdown. Unlike most war epics, it also works as an absurdist comedy about warfare, while never trivializing its consequences. Set in Japanese-occupied Burma during World War II, Bridge charts the machinations of one Colonel Nicholson, a British commander who has just surrendered to the Japanese Colonel Saito. As POW’s, the British soldiers are tasked with building a rail-bridge, a job Nicholson embraces wholeheartedly,(and rather paradoxically, considering he is aiding his captors). Meanwhile, an American POW escapes from the camp, but is forced to aid British commandos tasked with destroying the bridge. Confusion, chaos, and hilarity ensue. Rather than point out heroes and villains, Bridge carefully analyzes the motivations of each of its characters, perhaps Nicholson most prominently. He reasons that building the bridge will give the men purpose and resolve. And more importantly, it will stand as a concrete testament to the resolve of the British soldier under adversity. But Guinness also conveys the unhealthy obsession with his bridge mission, and the film continually lampoons ideas of British military honor. Add to this tension a sympathetic Japanese prison camp commander, and an American POW who simply wants to survive but keeps getting pulled back in. It’s true that the film can sometimes reduce its characters to types, and too often the characters announce their personal philosophies without prompting. But the screenplay manages some impressive situations that spoof the absurdity of wartime objectives. And the cinematography actually makes the film look more modern than it is, keeping the issues modern as well. Bridge endures because it manages to find the discrepancies between the individuals and the larger powers that command them. It’s got me positively riveted for Lean’s upcoming Lawrence of Arabia.